Covering the living room’s brick and wood fireplace surround with a horizontal-grained zebrawood veneer set the tone for the new modern style of the home. A calming neutral scheme is enhanced with a variety of textures, materials and pops of orange for warmth and visual impact. In addition, walls were opened up for better flow. “Frosted glass pocket doors between the living room and family room echo the rectangular recessed panels in the fireplace surround and allow the areas to be closed for privacy when entertain­ing,” designer Kingsley Belcher Knauss says. Dark-stained rift-sawn oak cabinets and contemporary hardware deliver the clean-lined feel the owners wanted in the remodeled kitchen. A glass, stone and steel mosaic backsplash creates contrast, and “playful Lucite seating and decorative lighting add personality to the space,” the designer says. The island’s dramatic waterfall top—in polished white quartzite—is juxtaposed by perimeter countertops in honed black granite with a leathered finish. Incorporating a desk for daily planning and Internet use was a priority for homeowner Nicole Dossin. “I spend a lot of time in the kitchen,” she says. A multifunctional bar—equipped with a beverage center, microwave, sink and plenty of storage—frees up needed space in the tight dining room around the corner. It also functions as a snack prep space for the kids away from the cooking zone. Designer Kingsley Belcher Knauss transforms a Colonial-style home in Westfield to suit the owners’ modern tastes. After relocating back to the United States, the couple purchased a house they outgrew after the birth of their two boys. They eventually purchased a larger home just up the street that gave them the space they needed, room to build a pool and the opportunity to customize with help from Knauss and associate designer Connie Henao in Westfield, NJ, architect Hildie Lazar of Lazar Architecture in Scotch Plains and builder Jim Peterson of Galaxy Building Contractors in Westfield. “Even though the house had adequate square footage,” Dossin says, “it didn’t have good flow on the first floor and really needed a lot of updating.” Rooms within the center-hall plan were all dead ends with no connection to each other, she says. There also was no access to the main rooms from the back of the house. Although a daunting task, the team united all of the first floor by dramatically enlarging the foyer openings to the living room and dining room and by changing the windows along the entire back of the home to single-pane French doors. “This created an open, light-filled gallery overlooking the pool area that connects the living room and kitchen,” Knauss says. The free flow from one space to the next also gives the feel of a much larger house. Traditional wood floors—refinished in a dark walnut stain—keep the house grounded by bridging the aesthetic divide between inside and out, she says. Knauss, a professional member of the American Society of Interior Designers, honed in on the client’s vision of a serene, modern haven with a savvy mix of custom-upholstered pieces, sleek finishes and wood species ranging from dark rift-sawn oak to zebrawood that pay homage to Damien Dossin’s South African heritage. 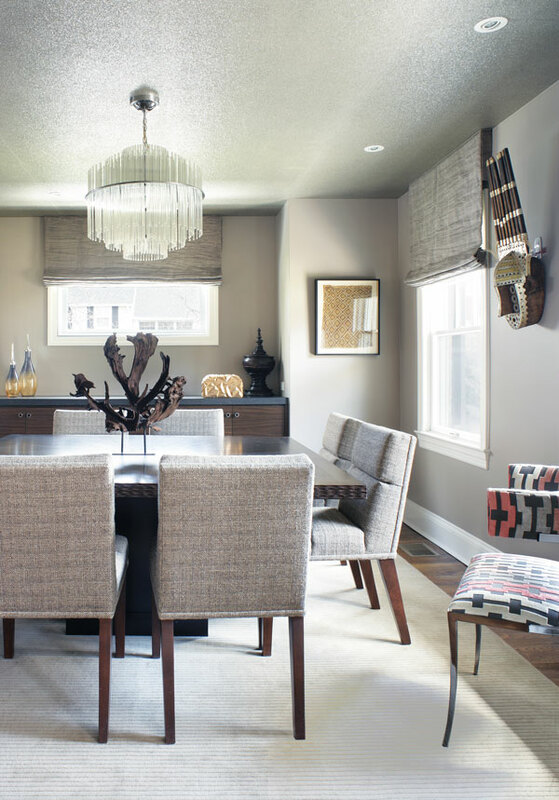 Those elements, which reappear throughout, combine with a palette of neutrals that share a common thread: layered gray tones, taupe and ivory along with pops of orange, one of Nicole Dossin’s favorite accent colors. No longer isolated from adjacent rooms and central to the redesign, the living room helped set the tone for the new, modern style of the home. “Converting the wood-burning fireplace to gas was key,” Dossin says. So was replacing the traditional brick and wood surround with a sleek horizontal-grained zebrawood veneer. LED-lighted side panels accentuate the grain of the wood. The reconfigured kitchen has a “minimal, slightly industrial feel,” Knauss says. Features include flat-panel dark rift-sawn oak cabinets and a glass, stone and steel mosaic backsplash. “The clean austerity of the kitchen is balanced with playful Lucite seating and decorative lighting that add personality to the space,” she says. Editor’s Note: For this project, KBK Interior Design won an ASID Design Excellence Gold Award for the best-designed residential space less than 3,000 square feet. Overall: interior design, KBK Interior Design in Westfield; architect, Hildie Lazar, AIA, Lazar Architecture in Scotch Plains; builder/contractor, Jim Peterson of Galaxy Building Con­­trac­tors in Westfield. Living Room: custom chenille sofas, KBK Interior Design; coffee table (discontinued), Kravet; chrome base chairs, accent tables and side chair, Schwartz Design Showroom in Metuchen (T); area rug, Paragon Mills (T) in Union; wall color, London Fog (#1541) by Benjamin Moore. Kitchen: custom rift-sawn oak cabinetry, fabricated by R&G Construction Cabinet and Millwork Inc. in North Plainfield; countertops, fabricated by Peter Brooks Stone Works in Wood-Ridge; tiled backsplash, Arena Stone Products Inc. in Carlstadt; stools, Knoll; cabinet knobs, The Bath Connection in Fanwood; pendants, West Essex Lighting Studio in West Caldwell; window shades, Chilewich through The Shade Store; Herman Miller Lucite chair, homeowners; wall color, London Fog (#1541). Dining Room: rift-sawn oak table, built-in zebrawood buffet, channel-tufted dining chairs, designed by KBK Interior Design; area rug, Major Mills in Clark (T); vintage glass rod chandelier, Antiques on Union in Lambertville (now closed); wall color, Waynsboro Taupe (#1544) by Benjamin Moore. Dressing Room: designed by KBK Interior Design and fabricated by R&G Construction Cabinet and Millwork; pendant chandelier, West Essex Lighting Studio. Master Bathroom: vanity, fabricated by R&G Construction Cabinet and Millwork; limestone countertop, backsplash and 12-by-24-inch porcelain tile flooring, Mediterranean Tile in Bernardsville and Fairfield. T = To the Trade.